Anyway, I moved the family back to Ohio last year. Bought a house, staked out my garden. 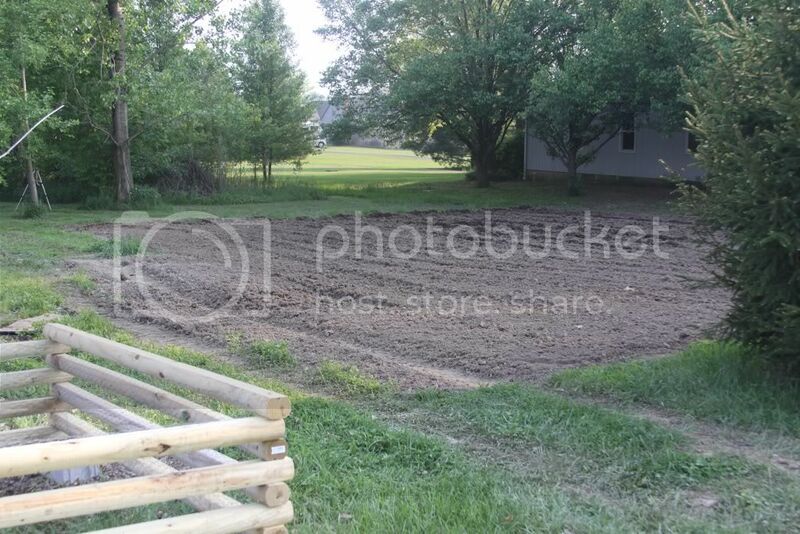 Used a sod cutter, cut out the sod, my neighbor tilled it a couple times.It's still too wet to plant, but I got my berries in. I've got 10 blueberry plants, strawberries, black and red raspberries in. 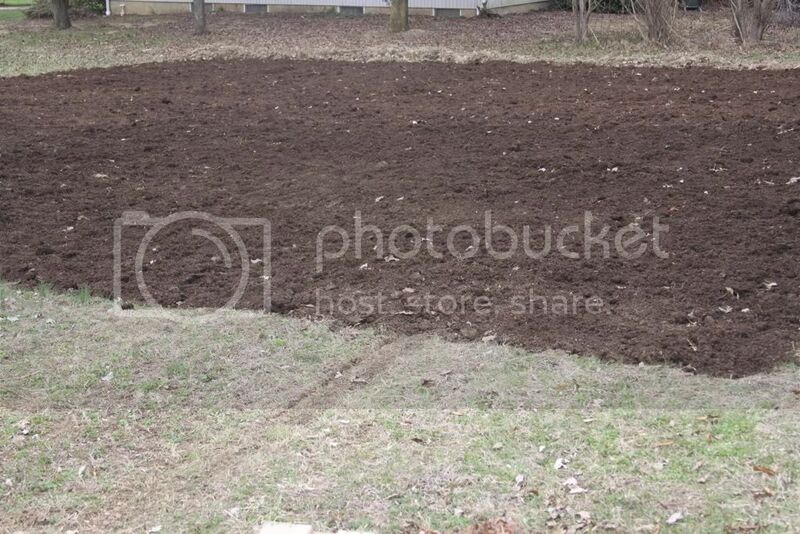 Garden area after 4 dump trucks of mushroom compost had been spread around evenly. It's 50x60ft. Probably too big, but we'll see. so thats where im at so far. 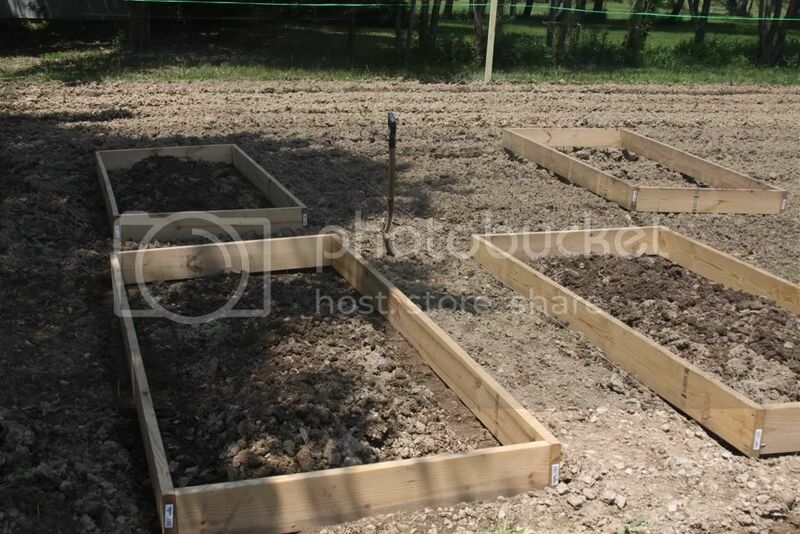 i got the blackberries and raspberries planted today but i havent taken pictures yet. 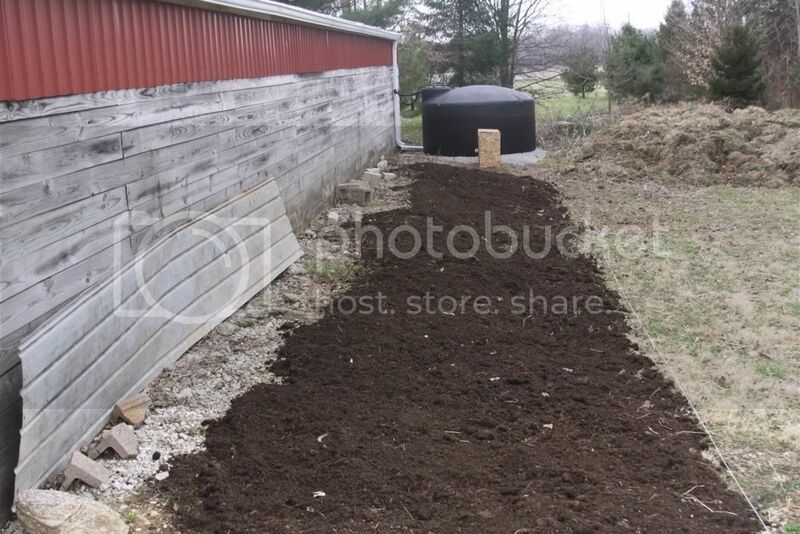 oh and i need to take a couple pics of my compost area. i really don't have a clue what I'm doing. i've been reading tons, but need to get in there and learn hands on. i'll post pics if you guys would like me to. i like seeing all of your pictures as well! Last edited by GregInOhio on Wed Jun 01, 2011 3:10 am, edited 2 times in total. Very nice. My only suggestion is that you may want to plant more once you catch the gardening fever. 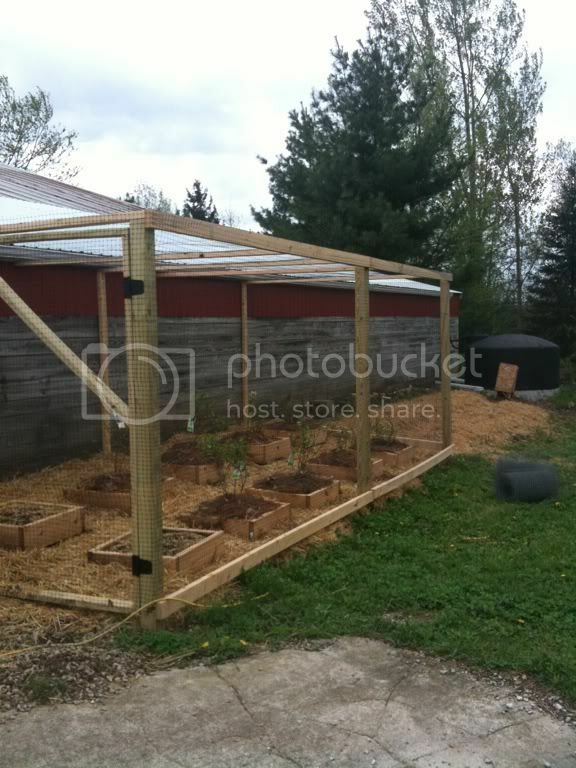 I would connect the center row to the two boxed next to each other and have a small raised bed just by adding a 2 foot board across the two adjacent beds! you have a walk way on the side and the beds look to be about 4 by 6 right? 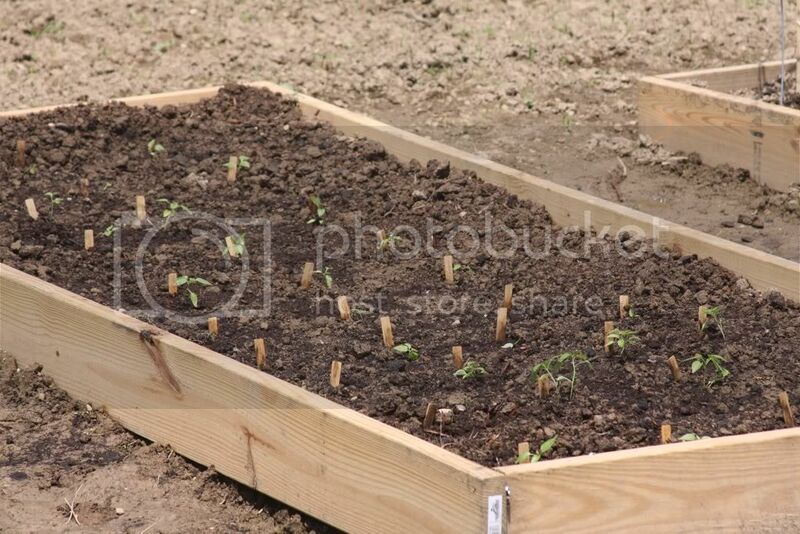 You could plant something that is small there like beets or carrots between the two main beds! Looks great, Greg! Glad you decided to join us! Your boxes are perfect, IMO. bobberman, i think you're talking about making my blueberry patch bigger? there are 10 plants there. maybe you're confusing that with the garden. I havent gotten anything planted in the garden yet. Too wet. 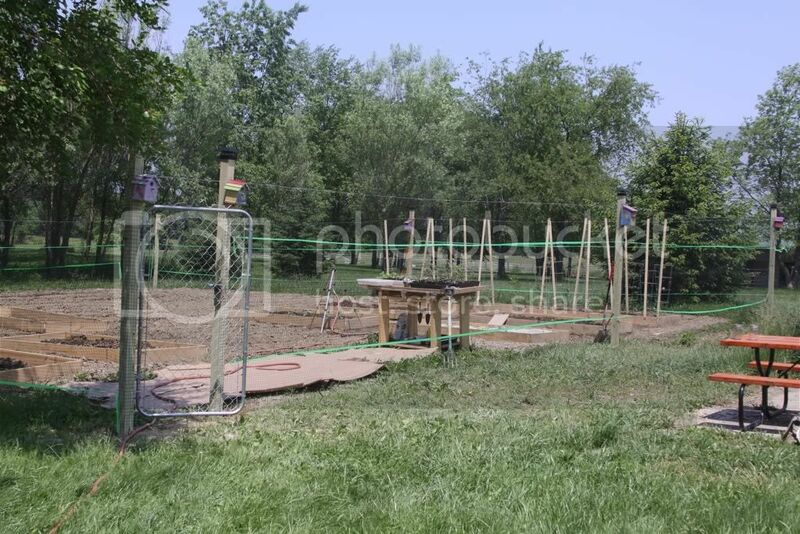 The garden is 55x60 feet with no beds yet. 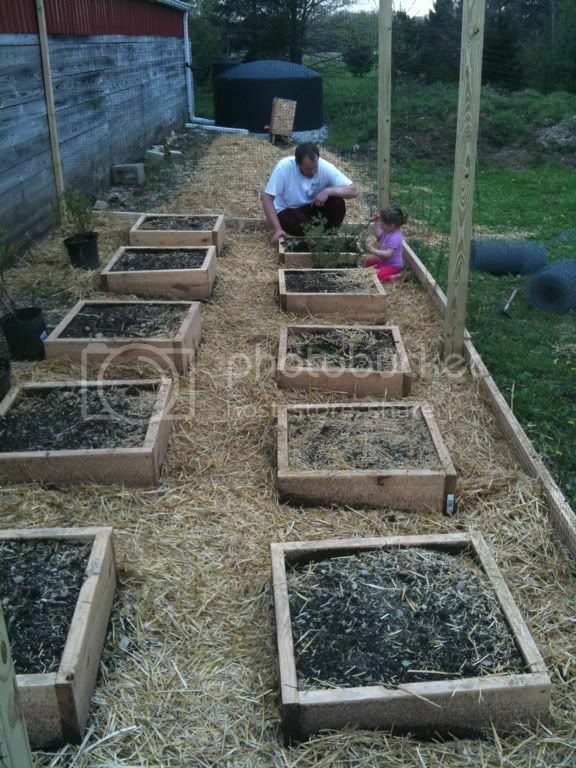 Looking at your 1st photo' my thought was, "Oh no, he's going to plant where the water will be coming off that roof!" 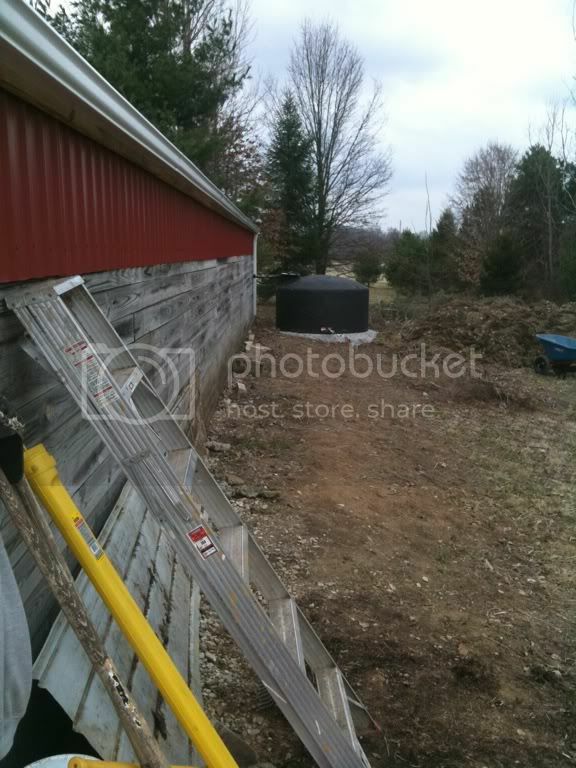 Then, a water tank with many feet of gutter popped up ! I'm sure the garden will get the same helpful attention and attention to detail. Here is Wishing You (& Yours), Happy Gardening! These are the trays I started inside. I learned stuff about planting from seed. I need more lights, more heat, and early on I had too much water. The tomatoes are looking really bad. The broccoli and cabbage are pretty good looking. Some of the peppers are ok. Oh well, live and learn. Our compost pile and our raspberries. There are 4 kinds. 2 of each kind. 8 plants total. 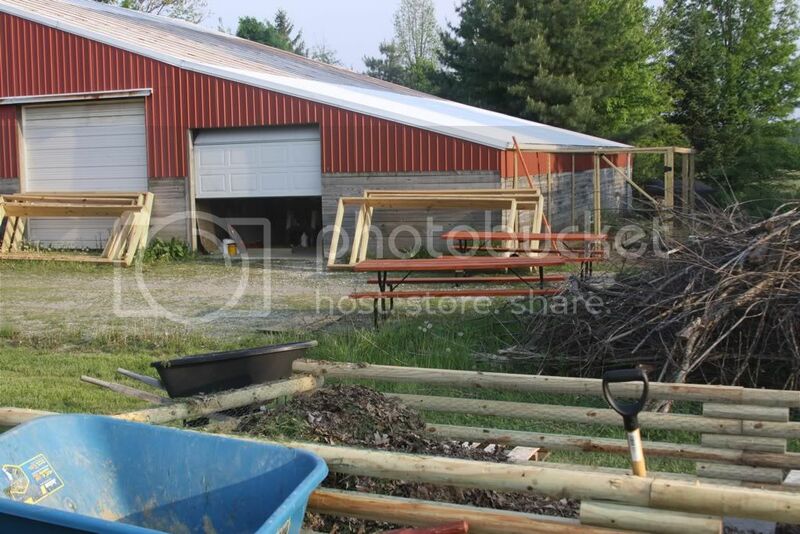 We're gonna make a v shaped trellis in a couple weeks. 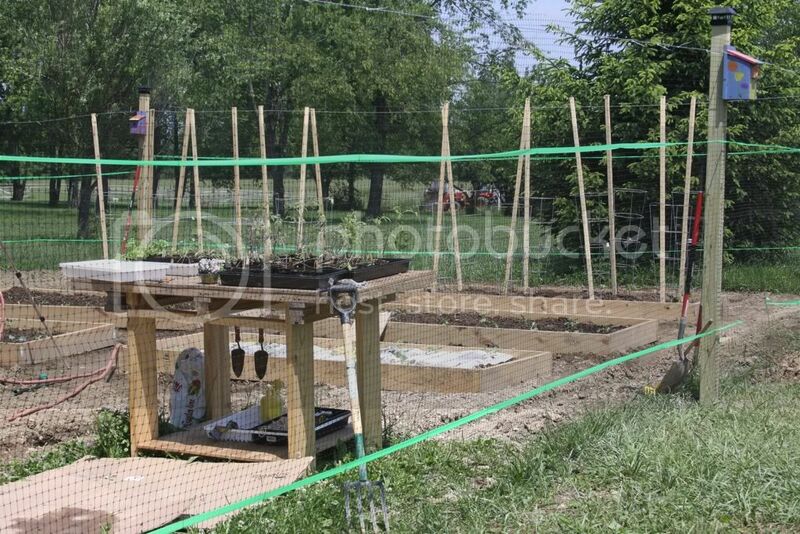 10 raised beds that we are gonna try out. oh and a couple picnic tables we stained today. (theres a little pic of the roof Brownrexx. 63ft wide. Garden, unplanted. 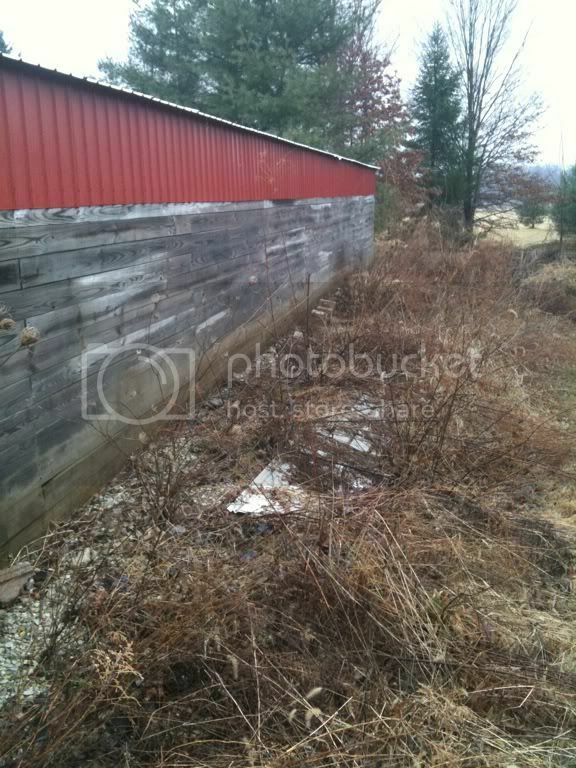 Neighbors house is close to our property line. She is the best though. Another closer pic of the strawberry area. I didn't have a good one from the last pics. 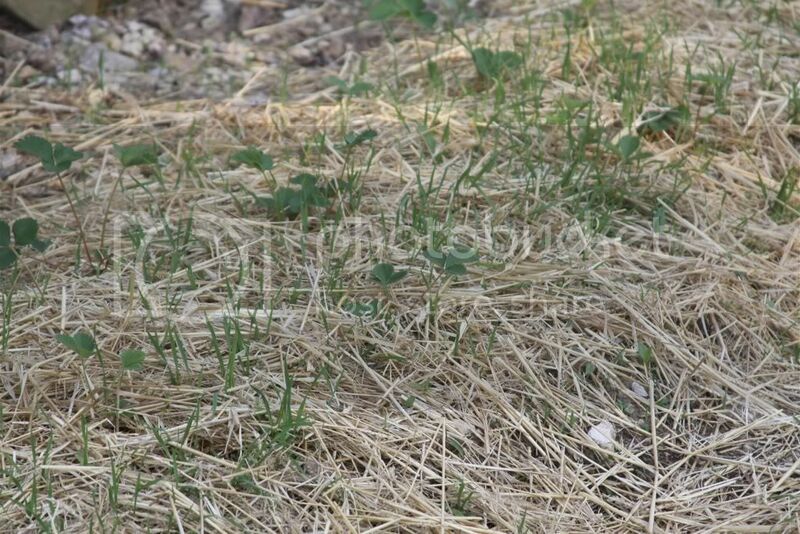 I'm getting alot of grass coming up thru the straw. How do you think i should deal with this? We're going out of town for a week. Will post pics of the garden and planting when I get back. Thanks again all. Have a great weekend!! 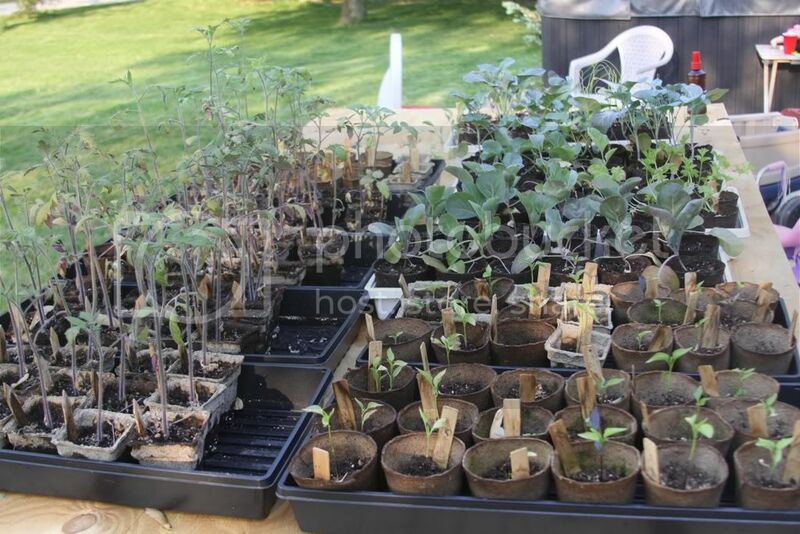 I never give tips on starting seeds for tomatos, peppers etc. I have done it for years now and every year my tomatos look just like yours at best. The good news is do not worry. 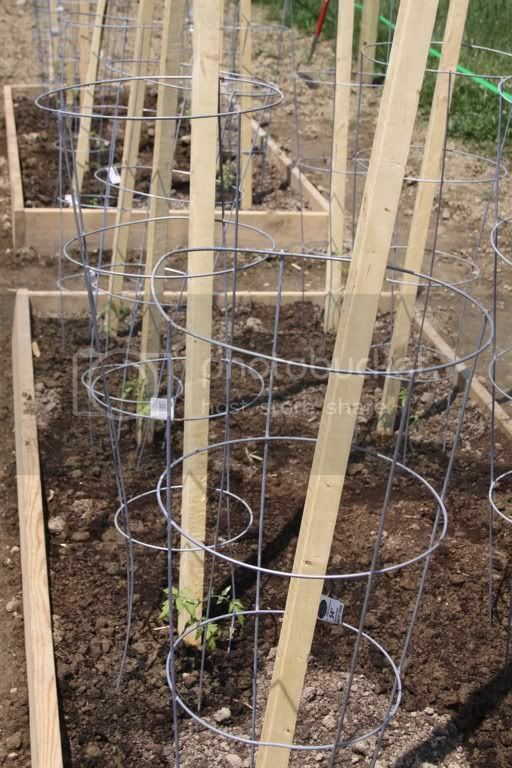 I plant my tomatos on their side so the whole stem is buried and just the top couple leaves above ground. They come on and grow grow grow. Again this year I am planting my tomatos that look just like yours. Today they are just a couple leaves at ground level but....... in a few months watch out. 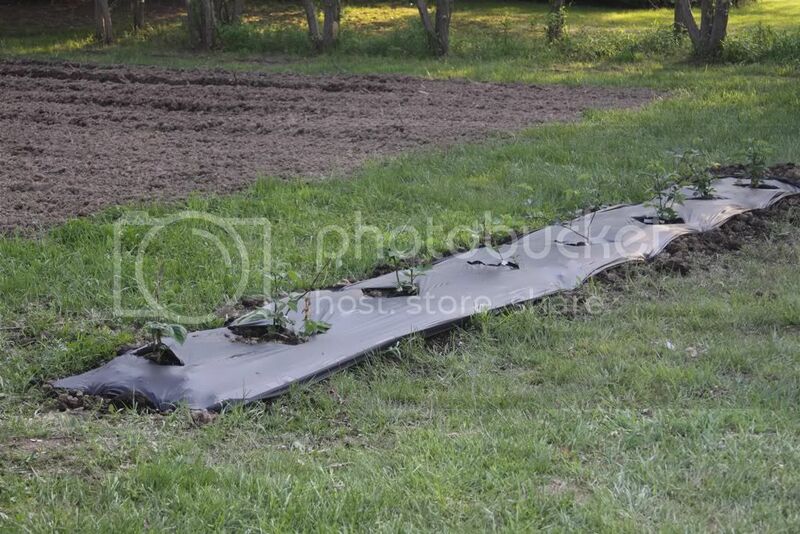 If it goes like years before I will have a 4' high hedge of tomatos bearing through summer and here in southern Ohio (I grew up, lived and learned to garden in NY) I will have tomatos till october. You are doing great. My wife looked over my shoulder and asked me who that girl was that I was looking at, drooling tansfixed. I said what girl and she pointed her out to me. Did you know there is a woman in your tractor picture? You have a good neighbor. Your operation is much larger then my square of dirt. I still just till and plant in rows with paths. I use the string on two stakes and all that stuff. 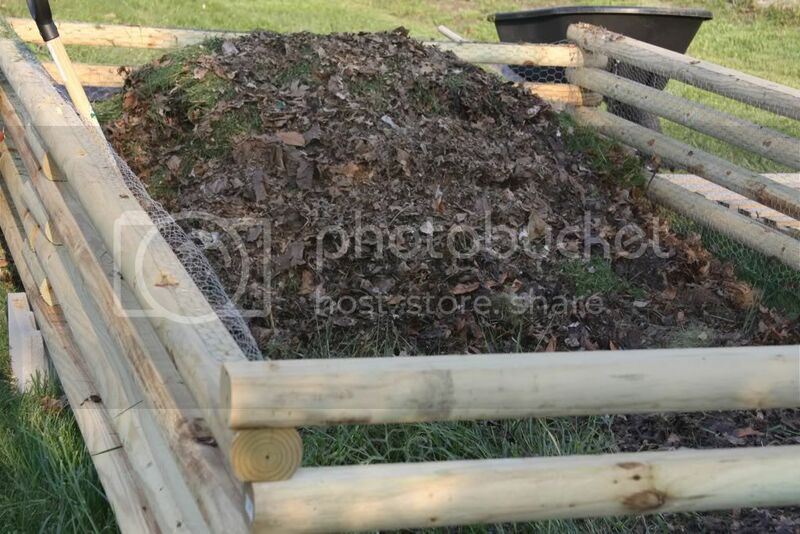 My ex was making raised beds. The cost for lumber and the work she put into them, then she was either hand turning or lifting the boards to have me till, seemed like a lot of work. 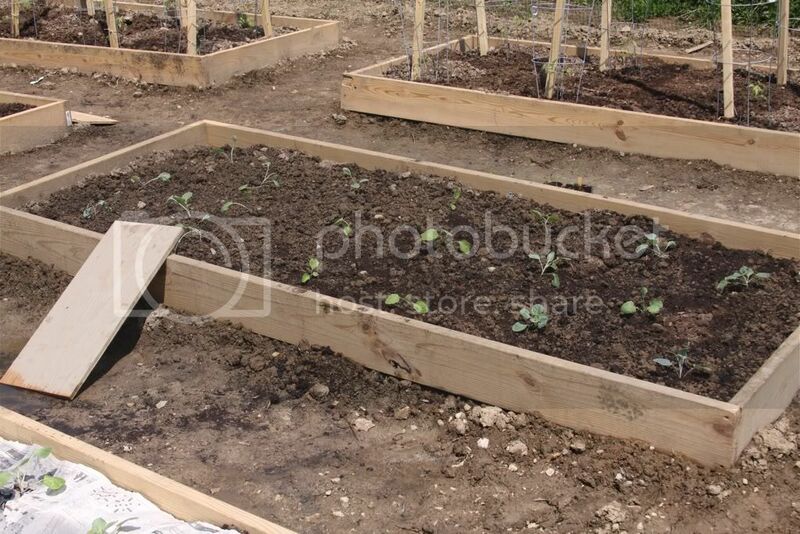 I know there are a lot of raised bed advocates out there. I try to keep it simple. I do have a thing about tilling. On my second troy-bilt in life (I want my old one back the newer model, well just not as solid as the old but..) I till everything in the fall, corner to corner. I spread manure, (pig, chicken and rabbit. no horse it is easy to find and usually free but I do not like it) and till some more. 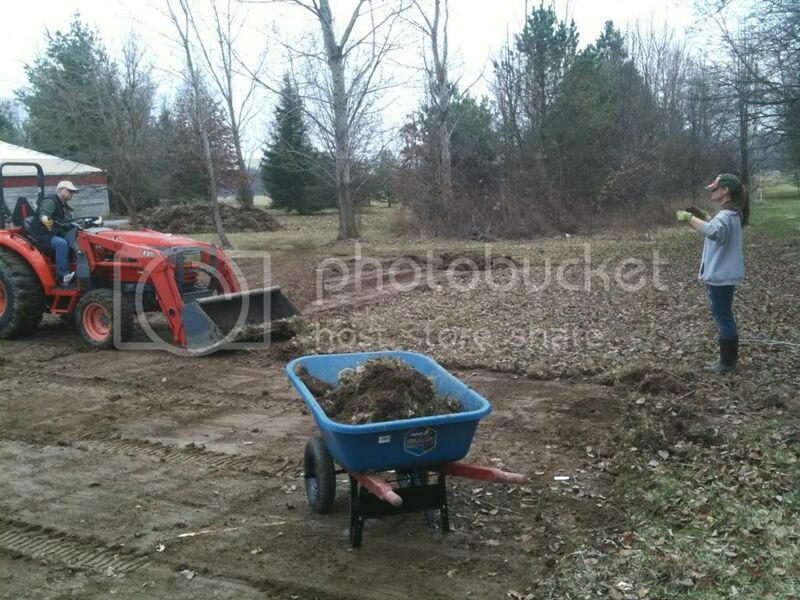 I till a couple times in the spring spreading compost and removing rocks. Then I till some more. lol ok maybe not thaat bad but my soil does improve and the part that goes to paths I consider my biblical fallow share. I have a raised bed for strawberries but it is somewhat decorative also. The cost and the dirt to fill it, it will take a while to the strawberries to pay for themselves. Well I have rambled long enough. Keep up the pictures and show more of that tractor please. 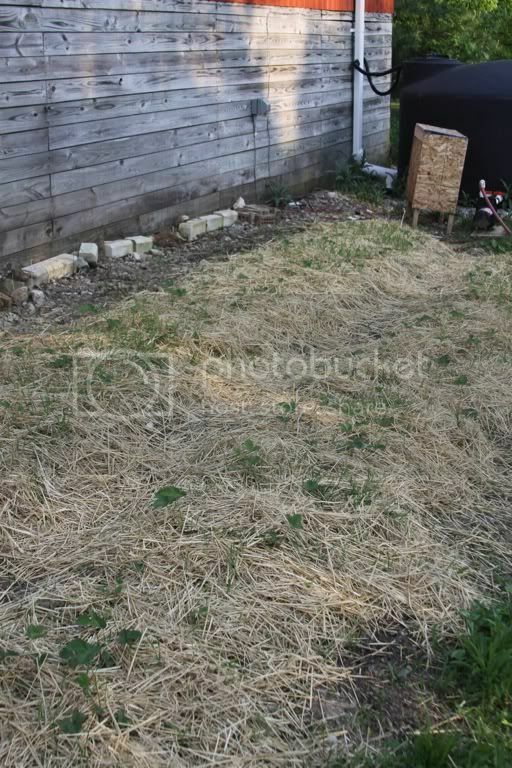 Wow, that is some first garden. Nice, Very nice. I like the flight cage around it. that'll keep them varmits out for sure. If it eat's my tomatoes before I get to pick a ripe one it dies. I went on my vacation, came home, and have been working on the garden. 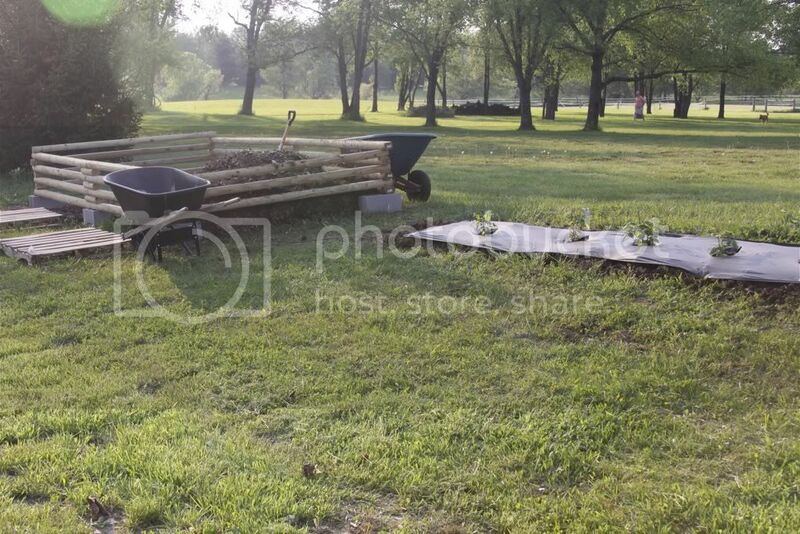 Here are some updated pictures of what we have been doing for the last week. 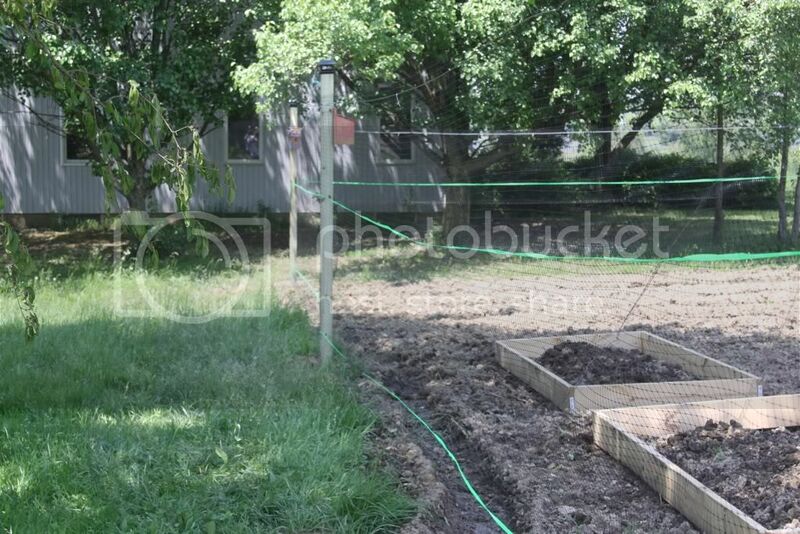 We put in the posts, deer netting, I put the green ribbon stuff up so the deer could see the fence. 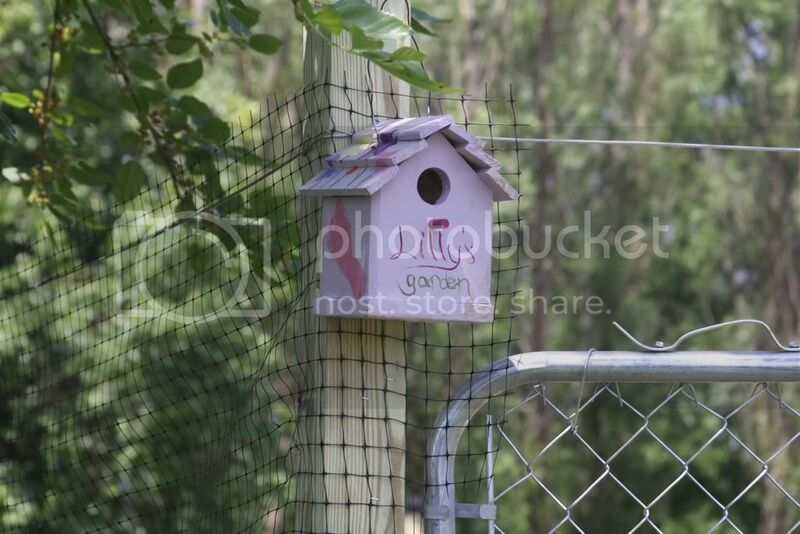 My wife added the birdhouse touch and I put solar post top lights on each post. They're not bright, but we have alot of deer, so anything we can do to help them see is a good thing. My wife painted each birdhouse. Lilly is our daughter. South side of garden. 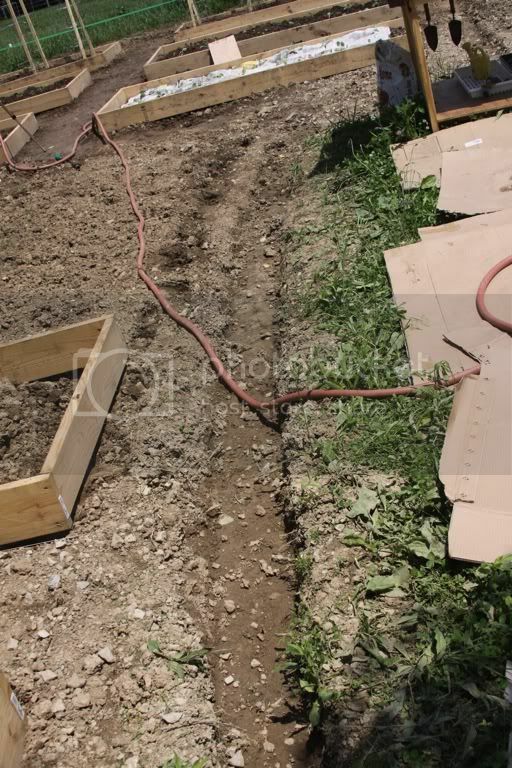 The trench is something I'm working on to reroute the water that drains thru the garden when it rains. Just got 3 of these 4 dug out. Going to plant them later today. This is cabbage. I put down the newspaper on this bed as an experiment. We'll see what happens. 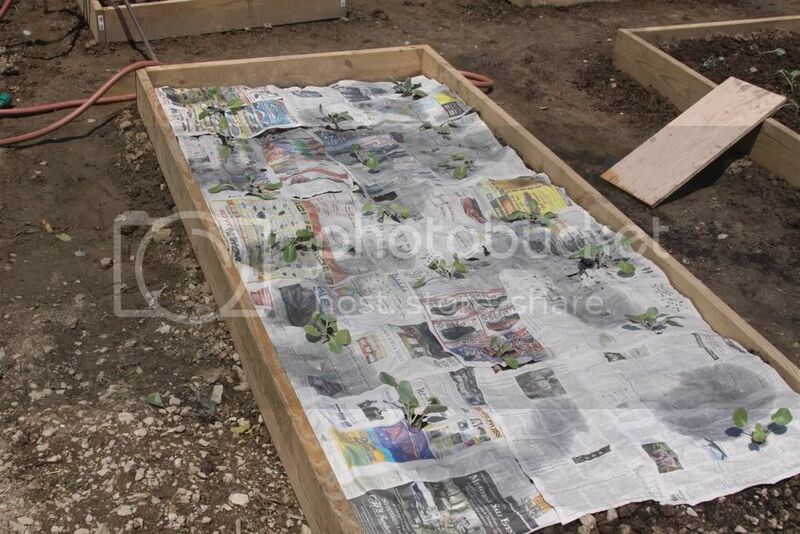 Anyone else use newspaper as mulch? 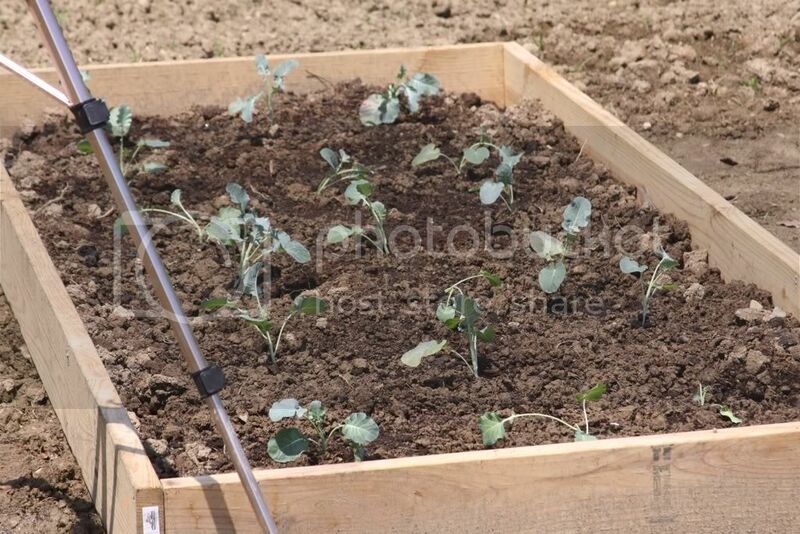 This bed has brussel sprouts, eggplant and cauliflower. The tomatoes. Staked and caged. 4 Big Boy, 4 Roma, 4 Cherry, 4 Beefsteak. Another pic of the trench on the east side of the garden. So there's the update! We're getting it going! I'll be back in a couple more weeks with another update. Probably sooner. Thanks for looking and have a great day.